"NP" drift stations carry out the program of complex year-round research in the fields of oceanology, ice studies, meteorology, aerology, geophysics, hydrochemistry, hydrophysics, and marine biology. On average, an "NP" station is the host for 600 to 650 ocean depth measurements, 3500 to 3900 complex meteorology measurements, 1200 to 1300 temperature measurements and sea water probes for chemical analysis, and 600 to 650 research balloon launches. Magnetic, ionosphere, ice and other observations are also carried out there. Regular measurements of the ice floe coordinates provide the data on the direction and speed of its drift. The modern "NP" drifting ice station resembles a small settlement with housing for polar explorers and special buildings for the scientific equipment. Usually an "NP" station begins operations in April and continues for two or three years until the ice floe reaches the Greenland Sea. Polar explorers are substituted yearly. Since 1937 some 800 people were drifting at "NP" stations. stations, drifting on the pack ice (i.e. relatively thin and short-lived ice):"NP-1" through "NP-5", "NP-7" through "NP-17", "NP-20", "NP-21"
stations, drifting on ice islands (glacier fragments, that were split from the shore): "NP-6", "NP-18", "NP-19", "NP-22". All "NP" stations are organized by the Russian (former Soviet) Arctic and Antarctic Research Institute (AARI). An idea to use the drift ice for the exploration of nature in the high latitudes of the Arctic Ocean belongs to Fridtjof Nansen, who fulfilled it on Fram between 1893 and 1896. The first stations to use drift ice as means of scientific exploration of the Arctic originated in the Soviet Union in 1937, when the first such station in the world, North Pole-1, started operations. North Pole-1 was established on May 21, 1937 some 20 km from the North Pole by the expedition into the high latitudes. Sever-1, led by Otto Schmidt. "NP-1" operated for 9 months, during which the ice floe travelled 2,850 kilometres. On February 19, 1938, Soviet ice breakers Taimyr and Murman took off four polar explorers from the station, who immediately became famous in the USSR and were awarded titles Hero of the Soviet Union: hydrobiologist Pyotr Shirshov, geophysicist Yevgeny Fyodorov, radioman Ernst Krenkel and their leader Ivan Papanin. Since 1954 Soviet "NP" stations worked continuously, with one to three such stations operating simultaneously each year. The total distance drifted between 1937 and 1973 was over 80,000 kilometres. North Pole-22 is particularly notable for its record drift, lasting nine years. On June 28, 1972 the ice floe with North Pole-19 passed over the North Pole for the first time ever. During such long-term observations by "NP" stations, a lot of important discoveries in physical geography were made, valuable conclusions on regularities and the connection between processes in the polar region of the Earth's hydrosphere and atmosphere were obtained. 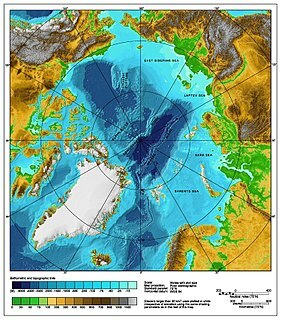 Some of the most important discoveries were finding the deep-water Lomonosov Ridge, which crosses the Arctic Ocean, other large features of the ocean bottom's relief, the discovery of two systems of the drift (circular and "wash-out"), the fact of cyclones' active penetration into the Central Arctic. The last Soviet "NP" station, North Pole-31, was closed in July 1991. In the post-Soviet era, Russian exploration of the Arctic by drifting ice stations was suspended for twelve years. The year 2003 was notable for Russia's return into the Arctic. As of 2006[update], three "NP" stations had carried out scientific measurements and research since then: "NP-32" through "NP-34". The latter was closed on May 25, 2006. "NP-35" started operations on September 21, 2007 at the point 81°26′N 103°30′E﻿ / ﻿81.433°N 103.500°E﻿ / 81.433; 103.500﻿ (North Pole-35 (start)), when flags of Russia and Saint Petersburg were raised there. 22 scientists, led by A.A.Visnevsky are working on the ice floe. Establishment of the station was the third stage of the Arktika 2007 expedition. An appropriate ice floe was searched for from Akademik Fedorov research vessel, accompanied by nuclear icebreaker Russia, using MI-8 helicopters, for a week, until an ice floe with an area of 16 square kilometres was found. The ice has since shrunk significantly, however, and the station is now being abandoned ahead of schedule. Since the mid-2000s it became difficult to find a suitable ice floe to station camp on, due to the global warming, and several stations had to be evacuated prematurely because of unexpectedly fast thawing of the ice, so in 2008 an idea to replace the ice camps with a drifting research vessel as a station core was floated. After almost a decade of deliberation, a contract of building the station vessel was awarded to Admiralty Shipyard in Saint Petersburg in 2017. This will take a form of a large self-propelled ice resistant barge of ~10000 tons displacement, getting to the initial point of the mission by itself or with a help of an icebreaker and continuing to drift with the surrounding ice. The barge, intended to function autonomously for 2-3 years, but equipped to be supplied by air or passing icebreakers, and equipped with the required research equipment, is expected to be commissioned in 2020. ^ "North Pole drifting stations (1930s-1980s)". Woods Hole Oceanographic Institution. Retrieved April 30, 2009. ^ Calvert, James, Vice Admiral USN Ret. (1996) . Surface at the Pole. Annapolis, Maryland: Bluejacket Books. p. 86. ISBN 1-55750-119-X. "NP-2" to "NP-34" drift trajectories a Google Earth file from the Arctic and Antarctic Research Institute, presenting trajectories of the drift of "NP-2" through "NP-34"